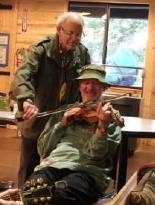 Music in the Mountains is a coordinated effort between Songmakers and Camp deBenneville Pines. It is a long time annual tradition which takes place the first weekend of November. This year, the event will be November 2nd-4th. For an extra $20, folks may arrive on Nov . 1st to enjoy the facilities with no meals provided. At 6,800 feet above sea level in the beautiful San Bernardino Mountains near Angelus Oaks, this crisp fall weekend is a perfect place to sing, jam, attend workshops and meet other musicians from all over Southern California. The main lodge with the large fireplace and cozy hearth is a gathering place for reading and relaxing for sipping hot drinks from the beverage bar which is always available. The planning committee has been working hard to bring a great weekend of workshops and activities. 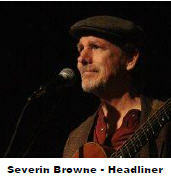 Our headliner, Severine Browne, will open for the evening concerts and give two workshops on songwriting. Other tentative workshops include: vocal tips, elementary lead guitar, music theory, performance skills, western ballads, ukulele, zentangle, stage set up, singalongs and a forum on using the lyric app “OnSong”. This year’s Music in the Mountains at at deBenniville Pines was a huge success with nearly 90 in attendance. The wonderful workshops were both educational and fun, the weather was pleasantly chilly, the food was outstanding, the people were friendly and the music was welcoming. Our headliner, John Zipperer, opened for both the Friday and Saturday evening concerts. His vibrant and friendly personality is contagious which made the attendees happy they came. John also gave two workshops which were very well attended. In his “Performance, Performance” workshop, attendees were asked to perform a song. Then, with his non threatening manner and positive attitude, John offered suggestions to improve our deliverance of the song. In his “Acting for Singers” workshop, John had the attendees work on facial expressions and body movements to convey the meaning of the song being sung. Both workshops were educational and beneficial to the folks in attendance. 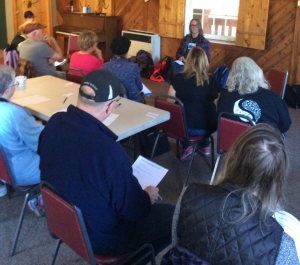 Other workshops, many given by Songmaker members, were well attended and praised by the attendees. A big thank you is in order to our wonderful workshop leaders who volunteered their time and talents to make this another memorable weekend. Joel Zimmerman started our days with an early morning gentle stretching session. Louise Dobbs led an all purpose singalong and provided songbooks for the singers. A great songwriting workshop was led by T-Dan Hofstedt, who shared his style of communicating life’s events into song. Brad Elias offered a session on interpreting the possible meanings of the lyrics in various songs that we remember. Joan Greenwald, although not a songmaker, is a regular attendee at MITM who shared her knowledge of flamenco style guitar. Eb Eberlein, who came all the way from Arizona, shared techniques on slide guitar. 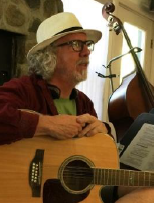 Doug Kerr led a sharing forum on taking lead breaks in songs. Annie Reeves, with her talent and enthusiasm, led a workshop on Mexican songs and rhythms. Finally, in a forum on the lyric apps ONSONG and SONGBOOK facilitated by Doug Kerr, Andy Gelencser, Bob DeVIlle and Paul Jenkins we shared with each other some of the features of these apps. Andy Gelencser led an organized hike to Jenks Lake. 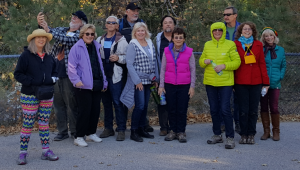 The weather was perfect for an easy hike and about 12 people showed up for this walk. 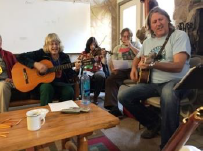 Along with these workshops, there were plenty of opportunities for impromptu jamming, relaxing by the large hearth in the lodge and catching up with old friends and meeting new ones. We had two evening concerts this year. Friday evening’s concert featured the workshop leaders and committee members with the charming and funny Alan Ferenze as the emcee. 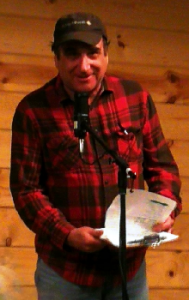 The Saturday evening concert featured the remaining attendees with the experienced Ron Bloom taking the role as emcee. The sound system that Songmakers purchased from Jim St. Ours was used for the sound. Sunday morning brought us two simultaneous “Songs of Meanings” sessions one led by Doug Kerr and the other by Bob Deville and Mary Hendricks. Having two sessions allowed time for all attendees to have their turn in sharing a song. Committee members who planned this year’s Music in the Mountains are Janice Gelencser, Andy Gelencser, Doug Kerr, Linda Szitkar, Mary Hendricks, Bob DeVIlle and Steve Berman, our Songmakers President. 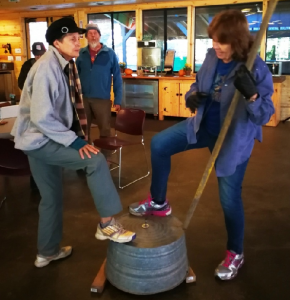 The eighty-five people who attended Music in the Mountains at deBenneville Pines Conference Center near Angelus Oaks last month experienced a weekend of warm, clear weather in a beautiful setting. The cozy clean cabins, the friendly staff, and the excellent food made it all perfect. The recent modernization of the lodge and infrastructure has made the camp facilities safe, comfortable and aesthetically pleasing. There were activities going on all weekend. On Friday after dinner, Carol Burton and Mary Hendricks led us in an evening of Cajun Dancing. With their expertise, they taught us dance moves to lively music with Louisiana roots. Our headliner, Tom Corbett, was a bonus to the weekend. He opened for the Saturday evening concert and led a Beatles and Monkees sing along as well as a Bluegrass sing along. What an amazing entertainer he is … friendly, fun and a serious flat picker! People loved having him there. In addition to lots of open jamming, there were a variety of workshops for folks to attend. Many Songmakers volunteered their time and talents to lead these workshops. As he does every year, Joel Zimmerman started our day with his popular early morning mind/body warm-up session. He also led a beginning violin workshop. There were enough violins available for all participants thanks to Bob Hall who lent some of his violins for the workshop. Jeff Linsky led a jazz chords workshop showing his attendees that jazz chords aren’t as scary as they seem. Brad Elias shared his skills in songwriting with some hands-on exercises in developing lyrics, melody and arranging a song. Sylvester Johnson’s session on “Voicing Inner Power” gave his participants ways for stretching the voice and relaxing the throat muscles for resonance and projection. 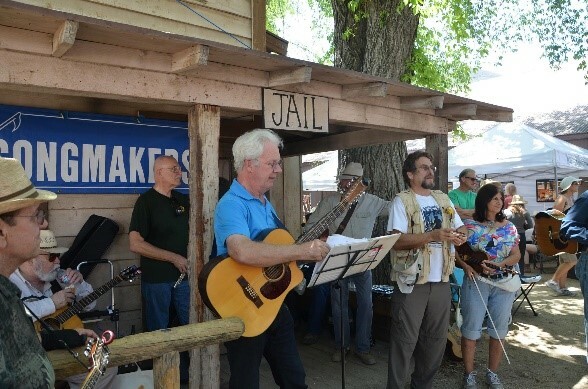 Ric LeShever was back again this year for his popular blues and boogie session where he taught some cool blues licks and a second open jam session. Bruce Farwell led a workshop on finger-style techniques for guitar which helped intermediate players expand their playing to include alternating bass rhythms and some arpeggio patterns. The planning committee provided a time for making some sturdy homemade rhythm instruments including drums, tambourines, sand blocks and maracas. Some of these instruments were used in the singalong sessions during the weekend. The 60’s sing along time that Louise Dobbs led continues to be one of the most popular sessions of the weekend. Doug Kerr helped out by projecting the words on a screen. Many people enjoy singing songs from this era and appreciate that it does not require an instrument to participate. 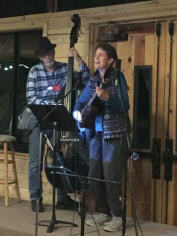 Finally, Ron Bloom and Carol Schryver, AKA “the MacMammals” offered a collaborative clinic on song presentation and arranging which aided the participants in creative ways of enhancing a song and sparking up its presentation. In response to the evaluations from last year, the committee made some changes to the weekend. The evening concert, which tends to be quite long, was shortened by holding a lottery for the campers who wished to perform. The entertainment included a variety of talented musicians. Alan Ferenz and Bruce Farwell shared emcee duties for the concert. The sound system that Songmakers recently purchased was used for the performance with Andy Gelencser, Karl Liscovski and Doug Kerr managing the sound. Sunday morning “Songs of Meaning” was held in two different rooms this year with Mary Hendricks leading one and Doug Kerr leading the other. This made the circles smaller so everyone had a chance to share a song in the two hour period that was provided. The committee which includes Doug Kerr, Linda Szitkar, Mary Hendricks and Janice Gelencser will be working throughout the year to bring you another great weekend in 2017. If you have ideas for the workshops, headliners or other suggestions, please contact Janice Gelencser at singolk@yahoo.com. We look forward to seeing you there in 2017.